O peaches, a beauty of summer - here they have started being replaced by autumn bounties while things kept me busy, so I have to rush, rush, rush to savor the fruits while I can. Because I love them. I love peaches! 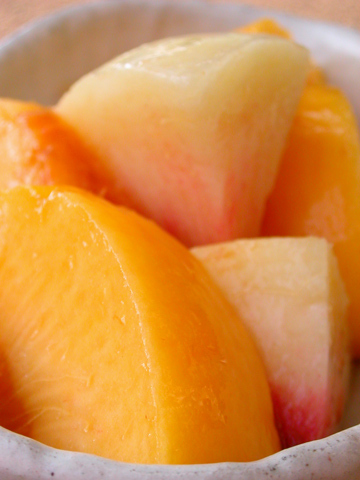 When I lived in Hawaii, one of the many things I would miss a lot was peaches. There were a bunch of peaches sold everywhere, of course, but none really rivaled what we have in Japan when it comes to eating them raw, except maybe the ones I got from Colorado in one summer. Peaches sold in here are generally large, juicy, sweet, mellow, scrumptious, delicious, you get the idea. And sure, they can be quite a luxury; one handsome, large white peach could cost $10 or more if you choose a high-end store. Most of them are of course a lot cheaper, but they still are a sort of fruits that can make you feel that you are eating something special. Back in the day, when you were looking for fresh peaches in Japan, you'd only see white ones; I don't think as a kid I ever saw yellow peaches anywhere except in heavy syrup in a can. I don't know where they came from, but fresh yellow peaches were never available until recently, and as far as I know, it is in the last decade or so that fresh yellow peaches have become accessible. And yellow-fleshed peaches we have in here are a variety named ogon-to, or literally, golden peach. I have heard that they are a sort of hybrid with white kind, and they really do taste like juicy and tender white peaches while distinctively retaining the apricot- or nectarine- like flavor and firm flesh of a yellow peach. I love them as much as regular white kind, and it has made me happy that the golden peaches are now commonly available everywhere. While I can't really afford a 10-buck peach, I do manage to treat myself with pretty ones once in a while. I got those white and yellow cuties in mid August (which is about a month ago, oh well...). This variety of white peach is named haku-ho or white phoenix; gold and phoenix nestled in styrofoam nets, now you might get some idea of how they are treated in this country. Like I have said, they both are made to consume raw, and that is what most people undoubtedly do. 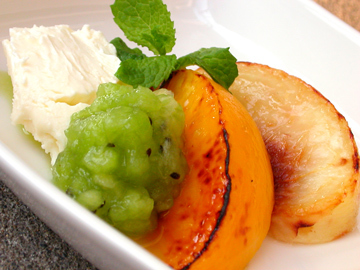 So did I.
Broiled peaches with kiwi coulis, for which I got an inspiration from one recipe. 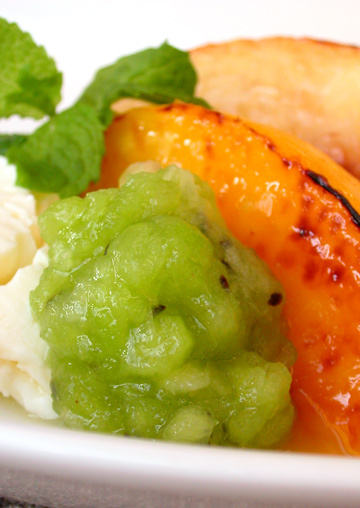 There is nothing particularly new about cooking peaches, but it seemed interesting to me to pair them with kiwi fruits like this. Now I only got the ideas from the recipe, and made several changes. First, I broiled the fruits rather than pan-frying them like suggested in the original recipe. I thought the peaches here would be too soft to get pan-fried for five long minutes, so I cut them into thick wedges, sprinkled them with some brown sugar and broiled for a few minutes. Second, I didn't mix up kiwi and mint - I simply stuck a spring of mint into a mixture of lightly crushed kiwi flesh and sugar, just to add a hint of mint to the coulis and discarded it after several minutes. I also served mascarpone cheese along with the fruits. I love peaches so much, they are so soft and juice. I'm going to try that recipe as soon as I can get my hands on some peaches and kiwi. Hi Chika! I was just thinking the same thing myself this weekend... I absolutely love peaches and the saddest part about summer ending is that with it go the peaches. So this weekend I bought twice as many peaches as I normally do with no plans but to eat them - out of hand, on my cereal... I'll have to try broiling them - yours look really good! I like very much that the photos make the fruit look naked and intimate, like sleeping lovers. beautiful! i love grilled fruits!!! sprinkled with a bit of brown sugar and served warm. pineapples and philippine mangoes(carabao variety) are great as well! or try cubed stone fruits stirfried chicken breast fillet or porkloin slices. 1) use a sweet or light soy sauce with a bit of sugar or honey, 1 tablespoon lemon and some light herb. The colors in the photos are so beautiful. I'm impressed! I am fascinated by what you said, that in Japan you used to only really get white peaches, since it was the exact opposite in the US. I mean, when I was little, we never saw white peaches at all. I bet they taste like heaven there though. Chika, what a wonderful ode to an amazing fruit. Those peaches look divine. I love peaches too and was recently blown away by the quality of the Taiwanese white peaches. Incidentally, the best use for those canned peaches is to infuse them in a vat of vodka for a week. The vodka will take on the peach flavor in the most divine way. The peaches themselves can't be eaten though. why can't they be eaten? how about chopped and added in pies or crepes ala mode? i love canned yellow cling peaches grilled over toast bread and cheese. YUM!! I thought of Momotaro when I saw the gold peach! They all look delicious and super juicy! I would like to invite you to participate in "I Like 'em Spicy! ", a fortnightly food event, where all participants have to come up with a spicy recipe using the Star Ingredient (which is different every fortnight)! 2. It has to be SPICY!! 3. Dishes can be of any form you can imagine, appetizers, mains, desserts, drinks...whatever you can come up with! On the 1st and 15th of every month, I will the post the Star Ingredient and you are expected to email your entries to hookedonheat@gmail.com by the next two weeks. At the end of the two weeks, I will post all the recipes on a special blog built especially for "I Like 'em Spicy!" so you can all view the fabulous entries! For further details do drop in "Hooked on Heat", at www.hookedonheat.blogspot.com and join in on the fun! I love this combination! Cheese and grilled fruit.. YUM! Might have to make some tonight myself... Thanks for the inspiration! 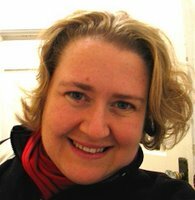 Hi, I just wanted to say that your photos are great and I just have to ask you which camera you use? I'm thinking of buying myself a new one and need some ideas!! Thank you all for the comments and suggestions. 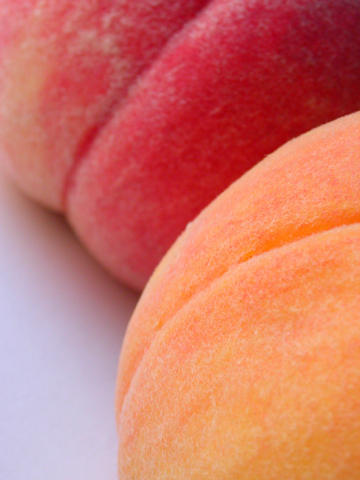 I see less and less peaches in the stores now, but I hope you guys have had your fill of peaches for this year! Chubby Hubby - peach-flavored vodka, that sounds sweet... come to think of it, I made a similar thing last year, though it was more of white wine than vodka. Good though. kayenne - I imagine, you could technically eat the peaches after they are soaked in vodka, but they won't taste good as they have given out all of its good part into the vodka they're in, perhaps? Ilva - I have been using a 3-year old Nikon CoolPix 2500, which is no longer manufactured, and there are a whole lot of better cameras available out there, I have to admit. I hope you'll find a good one for you, and for myself, I have been trying a couple different new cameras. I found this post--a year and a half later--while researching a post of my own about Japanese peaches (heavenly) and have linked to yours. 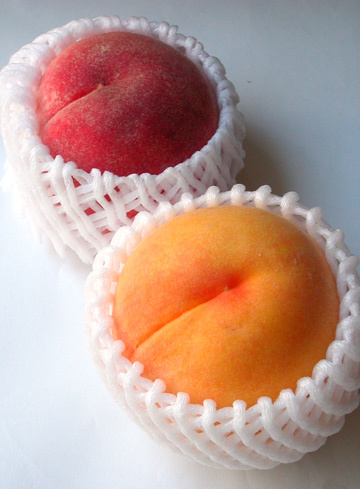 What gorgeous photos, the picture of the two peaches in their padded netting brought back Japan memories and made me smile. Thanks for a lovely post!